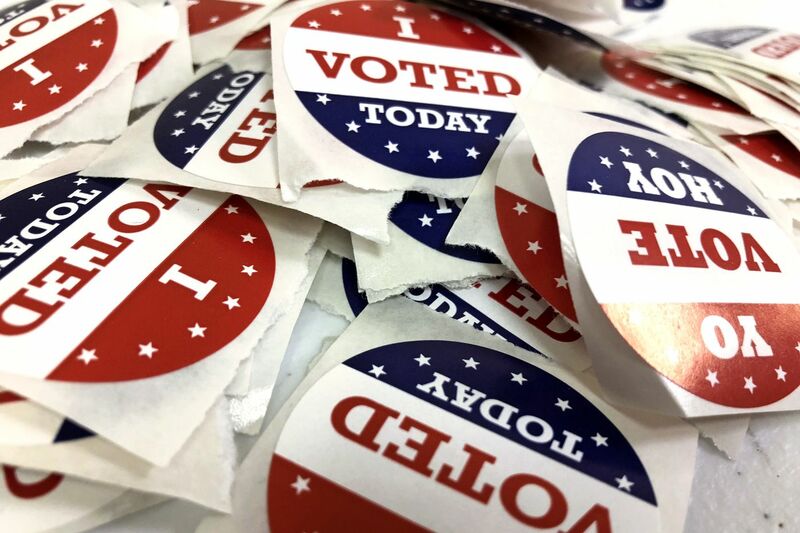 “I Voted Today” stickers, in English and Spanish, at the Camden County Board of Elections in Blackwood on Election Eve, Nov. 5, 2018. Health care dominated campaign advertising during the midterm election campaigns, popping up in about half of the ads, and exit polls show it was top of mind for voters. More people in the United States than ever before have health insurance, thanks to the Affordable Care Act (ACA). But over the last two years, Republicans, led by President Trump, have dismantled some key parts of the law, such as a rule requiring people to buy insurance or pay a penalty. The latest threat to the ACA is the administration's partial support for a lawsuit by 20 Republican state attorneys general that seeks to toss the law. The administration has said that it doesn't think the whole law should go, but that it won't defend the suit's attempt to eliminate the ACA's rules requiring insurers to guarantee coverage to those with pre-existing conditions — which can range from asthma and high blood pressure to cancer. With that backdrop, Democrats campaigned aggressively on health care — on protections for pre-existing conditions in particular — and intense public interest in the topic in a year when historic voter turnout helped Democrats win enough seats to take control of the U.S. House from Republicans, analysts and election-watchers said. "It's a referendum against the GOP war on health care," said Brad Woodhouse, executive director of Protect Our Care, a pro-ACA organization. Woodhouse spoke to reporters during a call organized by Health Care Voter, a Democratic organization he co-chairs that led an aggressive health-care advertising campaign prior to the election. One of the most hotly contested local races — in New Jersey's Third Congressional District — hinged on health care. Republican incumbent Tom MacArthur played a leading role in Republican ACA repeal-and-replace legislation, crafting the amendment that made it possible for the bill to pass the House. Democrat Andy Kim, who worked under President Barack Obama, said it was MacArthur's role in the repeal effort that spurred him to challenge the Republican for his seat representing New Jersey's Third District. With a narrow lead from mail-in ballots, Kim claimed victory Wednesday evening, but MacArthur has not conceded, and an official result may not come for days. The victor will join a House in which power is shifting from Republicans to Democrats, while the Senate remains in Republican control. Voters sent a clear message that they expect to see action from the federal government on health care, and both Republicans and Democrats have vested interests in pursuing legislation on health care. Still, progress won't be easy with a divided Congress. "There is disagreement over the means and ways and how we should ensure people have affordable, accessible coverage," Jeanne Lambrew, a senior fellow with the Century Foundation, a progressive think tank, said during a media call organized by the Center for Health Journalism at the University of Southern California Annenberg School for Communication and Journalism. With Democrats in control of the House, the ACA will be safe from any repeal/replace legislative efforts, which will give consumers and the health-care industry a level of certainty that's been missing the last two years, said Ben Isgur, who leads consulting firm PricewaterhouseCoopers' Health Research Institute. House Democrats probably won't be able to redo any of the ACA policies Republicans have already unraveled, but with control of the House, Democrats can block any new GOP attempts to further dismantle the law. That doesn't mean the ACA is safe, though. The Trump administration will continue picking away at key provisions through regulatory actions that don't require legislative approval. Trump's rule allowing short-term plans to cover people for 364 days is an example. (The ACA limited their duration to three months.) The day after the midterm elections, the White House released a new set of proposed regulations related to how the insurance marketplaces operate. Any major policy shifts are off the table with a split Congress, Isgur said. Democratic big ideas like Medicare for all will stay on the shelf for now, as such proposals would never survive in a Republican-led Senate. But bipartisan legislation in health-policy areas where Democrats and Republicans share interests is possible. Health-care costs — drug prices in particular — could be an opportunity for the two parties to build a "commonsense affordability" legislative package, said Andy Slavitt, who served as acting administrator of the Centers for Medicare and Medicaid Services under Obama, during a call organized by consumer health advocacy group Families USA. Republicans will want to look at the ACA again, too, said Lanhee Chen, a Republican policy adviser and research fellow with the Hoover Institute, a think tank at Stanford University. They could pursue smaller initiatives, such as measures to ensure stability in the ACA marketplaces after 2019, when Republican legislation to reduce to zero the penalty for not buying insurance takes effect. "They certainly cannot leave health care where it is. Politically, going into 2020, that would be perilous," Chen said during the media call organized by the Center for Health Journalism at USC. With little ACA action expected in Congress, look for moves at the state level, analysts said. States have big opportunities to pursue their own health-policy changes and, potentially, set an example for national change. Many of the policies pursued at the national level were first tested in smaller state markets, Lambrew said. New Jersey is one of just three states, plus Washington, D.C., to establish its own requirement that people buy health insurance or pay a tax penalty, but other states could follow. States could also experiment with their own ways to control drug prices and ease the financial strain of health-care costs. Others will be taking action on Medicaid expansion following the election. Ballot measures to expand Medicaid succeeded in three solidly Republican states — Nevada, Idaho, and Utah. And Republican-led measures to restrict access to Medicaid, such as work requirements, will almost certainly be abandoned in Kansas and Wisconsin, where Democrats won gubernatorial races. Looking ahead, analysts said they expect health care to continue to play an important role in the elections, potentially being a major dividing point between Republicans and Democrats — and even among candidates of the same party — in the 2020 campaigns.